Heavy Duty Work Uniform Gun Leather Belt. 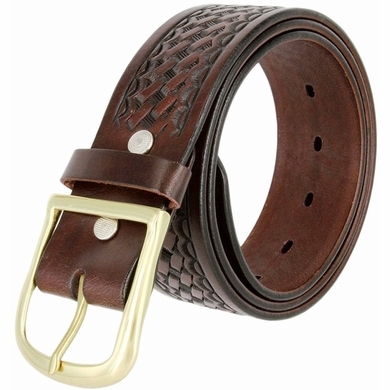 1.75" wide Genuine Leather Belt with Basketweave Embossing. Polished Solid Brass Center Bar Belt Buckle Style. Belt is measured from where the leather ends at the buckle to the middle hole at the tip end. In order to get your size, measure a belt that currently works for you from the fold where the buckle is to the hole where you wear the belt.